For the most part upgrading to Mountain Lion has been surprisingly smooth. If you are curious as to what is happening keep reading. If you just want it fixed scroll down to the solution. The issue appears to be that with the upgrade to Mountain Lion we have upgraded the version of OpenSSH. Googling around I found this page [http://www.held.org.il/blog/2011/05/the-myterious-case-of-broken-ssh-client-connection-reset-by-peer/] which describes a similar situation. It speculates that the list of ciphers being sent with the request is too long and somehow triggering the server to drop the connection. One of the workarounds is to specify the cipher list manually and sure enough that seems to fix my problem. and that worked well for me. # Fix connections that broke in mountain lion. Obviously you will have to change yourserver.com to the host you are connecting to. If you want this to apply for all connections use ‘Host *‘ and it will match against all connections. Save that file and you should be good to go. HTML5 Edition for Web authors is the HTML5 spec without the ugliness. The announcement is worth checking out too. There is also a video that talks a little about how it’s made. This game is awesome. Even when it’s ridiculously hard it’s fun, and it does get hard. Definitely check out the demo. I’m happy to announce the release of a plugin for XBMC. I know some of you have been asking for it. Go to the plugins page to download. 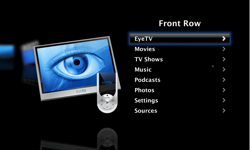 I have received multiple requests about a plugin for EyeTV. I don’t have the EyeTV software so making a plugin required some help from someone who does. Thankfully some of those wanting the plugin were able to provide me with the info that I needed. It works in Snow Leopard and is available on the Front Row Plugins page. Special thanks go out to Roger Quinton and Claudelee for making this happen.